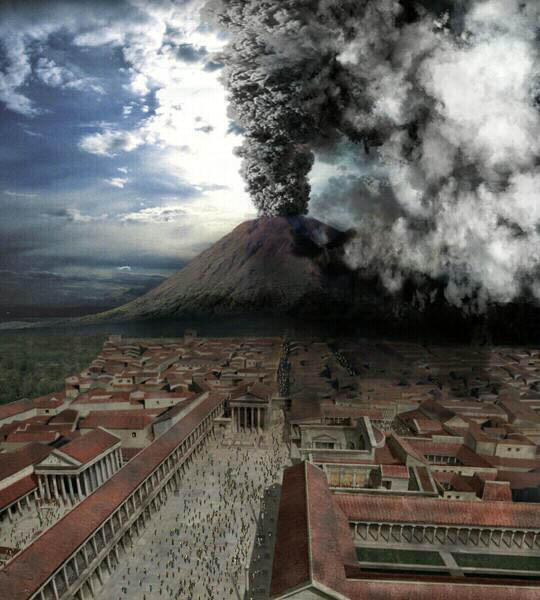 Computer-generated imagery of what Vesuvius might have looked like the day it exploded on Aug. 24, 79. It was probably a day like many others for the inhabitants of the Italian cities of Pompeii and Herculaneum near the Bay of Naples. They were accustomed to the periodic belching of the great Vesuvius volcano, which was again acting up. But unlike past occasions, this time Vesuvius would erupt in earnest. The date was Aug. 24, 79. The ensuing ash storm destroyed the, killing thousands who failed to flee in time, killing thousands and burying the two cities beneath mounds of ash and pumice. The Roman writer, Pliny the Younger, was in the region when Vesuvius erupted. In the account he left, Pliny says that the ash storm lasted some 18 hours. He probably wasn't exaggerating. Scientists who have sampled local lava deposits note that Vesuvius's volcanic activity dates back at much as 400,000 years.